Well, he hasn't actually won a primary election yet, but Florida Sen. Marco Rubio thinks he's at least one step closer to victory after Saturday's GOP primary in South Carolina. Rubio and Texas Sen. Ted Cruz finished in a virtual tie for second place, though for most of the night it seemed like Rubio had a slight edge over Cruz — and both of them finished behind winner Donald Trump. In his victory speech, Rubio declared a "three-way race" for the GOP nomination, claiming that the party's decision had effectively been narrowed down to Trump, Cruz, and himself. Rubio's speech came shortly after former Florida Gov. Jeb Bush announced that he would drop out of the Republican party's race. Bush came in fourth on Saturday in the Palmetto State, another disappointing finish for his campaign, particularly after it finally enlisted the help of Bush's well-known older brother and mother throughout the week leading up to South Carolina's primary. Particularly with Bush officially out of the race, it seems hard to argue with Rubio's idea of a "three-way race." Although Ohio Gov. John Kasich and retired neurosurgeon Ben Carson signaled that they would not immediately drop out following their fifth and sixth place finishes, respectively, their campaigns don't seem to exude the same momentum as the top three South Carolina winners. 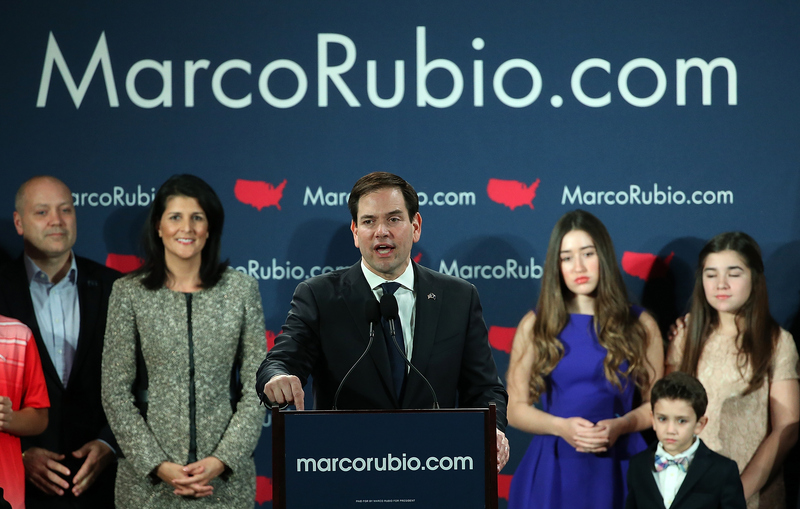 In celebrating his near-victory in South Carolina, Rubio also proclaimed that he would lead America into a "new American century." He can't necessarily claim that leadership yet, considering the race for the nomination is far from over, but he is probably right that this is now a new era for the 2016 election at least. Until now, this election has been largely about the crowded field of candidates — and the drama surrounding the big names like Trump and Clinton. With each caucus or primary, though, more and more candidates have left the race, clearing the way for a solid hierarchy to emerge. Cruz, Trump, and Rubio all finished strongly in Iowa. Trump emerged as the New Hampshire winner. Now, it's Trump, Rubio, and Cruz at the top once again in South Carolina. If you've been following the Republican side of the race at all, it should be clear to you by now that these three candidates don't plan on dropping out anytime soon — and they don't have a reason to, either. Not only have Trump, Rubio, and Cruz made strong showings in the early primary states, but the system for measuring their success will be changing soon, in a way that could make all the difference. The race for the nomination is all about delegates: In each state's primary, candidates are competing for votes, in order to earn a proportional number of delegates at the party's nominating convention. In Iowa, New Hampshire, and South Carolina, delegates were awarded based on a candidate's proportion of the vote. That's also how things will go for the so-called "Super Tuesday" primaries on March 1. This process allows even poor-performing candidates to receive a small number of delegates. On March 15, the process for earning delegates changes for Republican candidates. It becomes a winner-take-all system, meaning that the candidate who receives the most votes in a given state wins all of the delegates allocated to that state. The winner-take-all system leaves little chance for poor-performing candidates to move closer to the nomination, which could force more candidates out of the race — that is, if they haven't dropped out already at that point. One other thing to note: The South Carolina GOP primary has a funny way of predicting the future nominee. Since 1980, only one candidate has gone on to win the party's nomination without winning the Palmetto State. That's not necessarily good news for Rubio, but it does support his claim that the competition is getting closer and the field of viable candidates is getting narrower. In a race as fluid and unpredictable as this one, there's really no telling who will emerge as the ultimate winner, even if the choice can be narrowed down to three.